John Loehlin was born in India in 1926 of US missionary parents. He was educated at a mission school through high school, and came to the US in 1943 for college. He attended Wooster, Baldwin-Wallace, and Harvard Colleges, graduating from the last with a degree in English Literature in 1947. After working for a year and a half in an advertising agency in Cleveland, he entered graduate study in Psychology at the University of California in Berkeley, from which he obtained a PhD in 1957—with a two-year timeout for service in the US Navy in the Pacific during the Korean War. From 1957 to 1964 he taught in the Psychology Department of the University of Nebraska, where he met and married Marjorie Leafdale of the English Department. They have two children, Jennifer and James. From 1964 until his retirement in 1992 he taught in the Psychology and Computer Science Departments at the University of Texas at Austin, where he is Professor Emeritus. His research has included work on computer models of personality; work with twins in collaboration with Robert C. Nichols of the National Merit Scholarship Corporation, Nick Martin of the Queensland Institute of Medical Research, and others; and a longitudinal study of 300 Texas adoptive families with Joseph M. Horn and Lee Willerman. 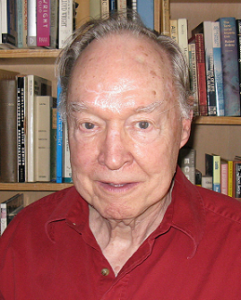 He is author or coauthor of a hundred-plus journal articles and book chapters, of seven books: on behavior genetics, computer models, and theories of personality; and of two volumes of light verse, Verses of a Young Man and Verses from Later Years. *FABBS would like to thank Dr. Jenae Neiderhiser and Dr. Eric Turkheimer for nominating Dr. Loehlin for this honor and for leading the effort. Would you like to honor Dr. Loehlin? It’s not too late to have your name added to the list of donors! You can make your donation to Dr. Loehlin’s In Honor Of… campaign at anytime.